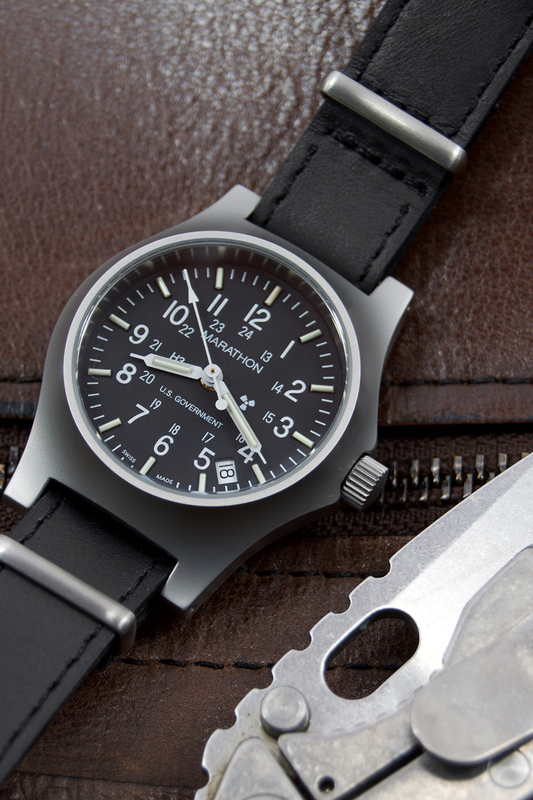 The General Purpose Quartz with Date and Tritium in Stainless Steel by Marathon is inspired by the historic Marathon GG-W-113 field watch, but also fulfills the latest governments specified military standards. 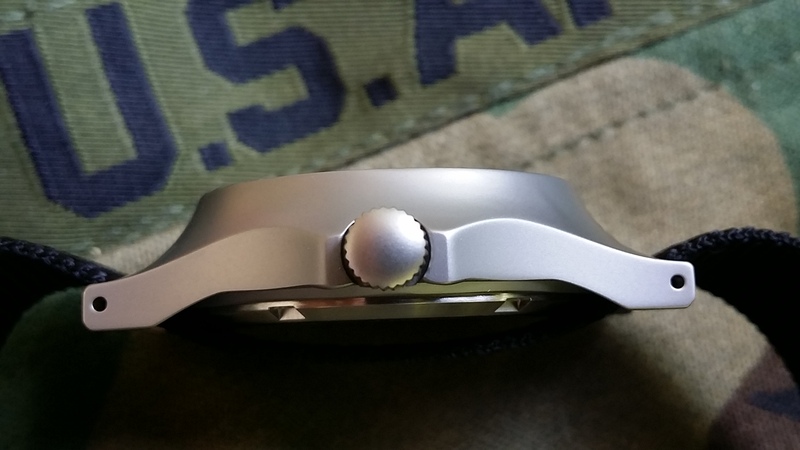 Designed for field use the watch features a high torque quartz movement with EOL (end of life indicator for battery) and self-glowing tritium for low light viewing. This version has a 316L surgical grade stainless steel case for durability and an elegant look. 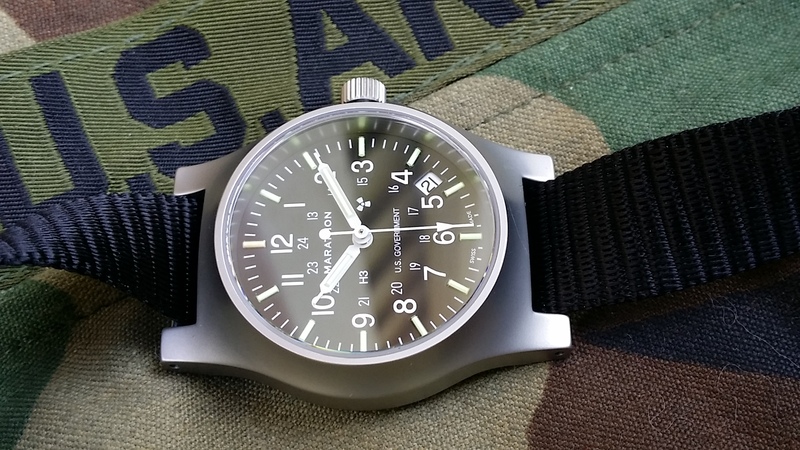 The General Purpose Quartz with Date and Tritium is a Swiss made authentic military watch built to withstand the needs of infantry, as well as civilians looking for a perfect watch that can be worn in both casual and more elegant environs. The General Purpose Quartz with Date in Stainless Steel combines good looks with military durability and Swiss craftsmanship to provide an accurate timepiece that will satisfy you for years to come. 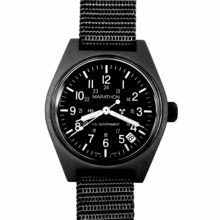 The Marathon General Purpose Quartz Date Watch is inspired by the historic Marathon GG-W-113 field watch, but also fulfills the latest government specified military standard of MIL-PRF-46374G, TYPE I, CLASS 1. Built with a case made from 316L surgical grade stainless steel, and using the high torque 3 jewel ETA F06 movement, the Marathon General Purpose Quartz in Stainless Steel is a vintage-inspired timepiece that is as good looking as it is durable. 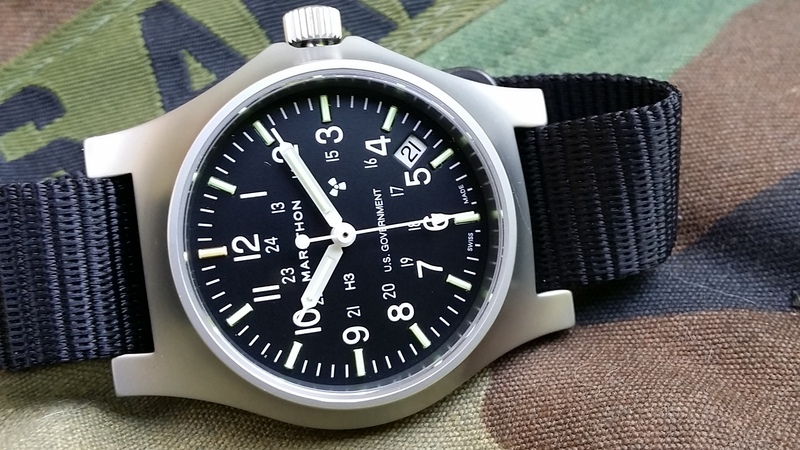 The Marathon Stainless Steel General Purpose Quartz comes packed with features essential for military operations, such as a24-hour dial, one-piece nylon strap, drilled lugs, a high-torque high-accuracy movement, constant glow tritium illumination tubes, and much more. 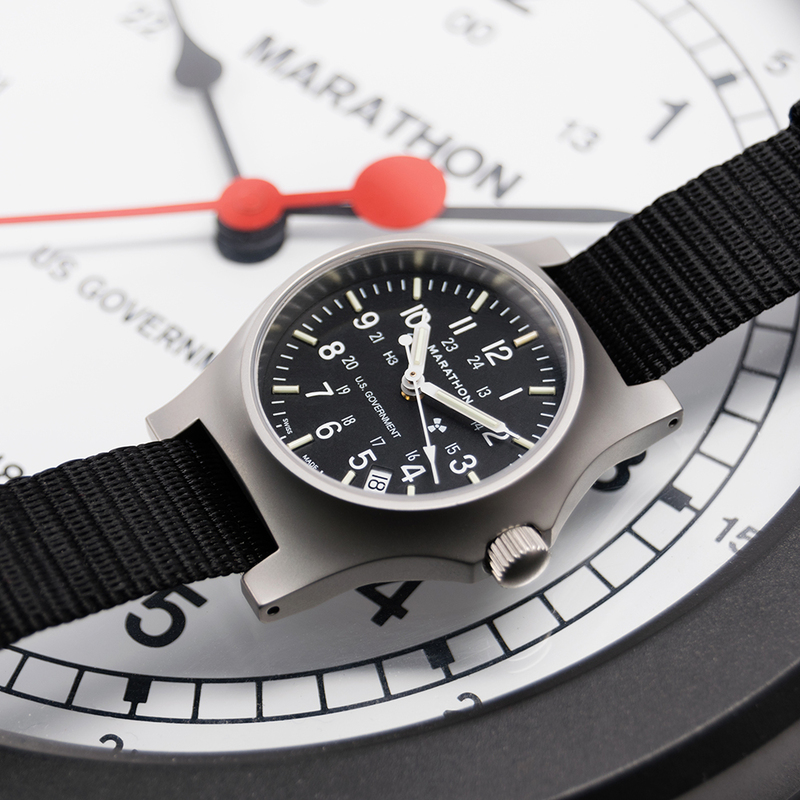 Inspired by the Marathon GG-W-113 field watch used throughout the 1980s by the US Army, the Marathon General Purpose Quartz in Stainless Steel revives this vintage style with an update of modern materials and standards. 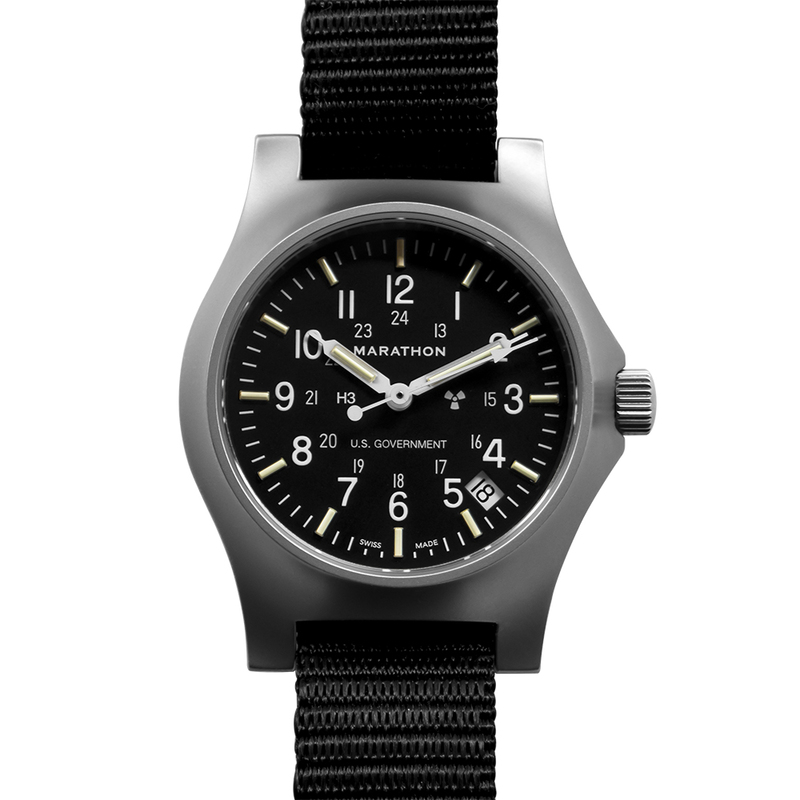 The Marathon General Purpose Quartz in Stainless Steel is manufactured from 316L surgical grade stainless steel with a satinized graphite grey finish, giving the look of a vintage field watch with the proper functionality and durability of a modern one. The crystal (glass lens) of the Marathon General Purpose Quartz in Stainless Steel is made from sapphire, as sapphire crystals are the ultimate in scratch resistance, overall durability, and clarity of dial viewing, essential factors for military personnel. 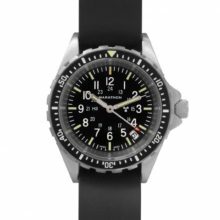 To assist in low light viewing, the dial of the Marathon General Purpose Quartz in Stainless Steel uses tritium tubes for the hour indices as well as hour and minute hands. Tritium is a self-illuminating gas which will provide a 24/7 glow without the need for charging by an external light source. The ETA F06 is accurate to -0.3/+0.5 seconds per day and also includes an End of Life (EOL) indicator that will advance the seconds hand once every 4 seconds when the battery is low to inform you that a battery change is needed. 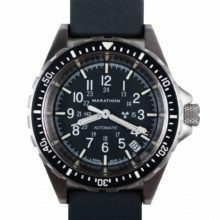 The Marathon General Purpose Quartz Date Watch is a beautiful and functional watch that will give years of enjoyment.